I want to learn the ways of the Force and become a Jedi like my father. Fortunately, Disney got smart and now allow kids to queue up in front of the nearby Sounds Dangerous building (Sounds Dangerous being a show that is closed). Kids have to be between the ages of 4 and 14, and be able to take instruction. The first 15 kids in line are selected for each show. The Cast Members talk to the kids to make sure they meet the requirements and then give the kids a plastic card to hold so that no one cuts in front of them in the line. Any kids who are in line beyond those first 15 are able to wait for the following show. It’s a very efficient and fair way to do things. Another great thing is the Disney Photopass Photographer who is on hand snapping pictures that most of the parents aren’t able to get. 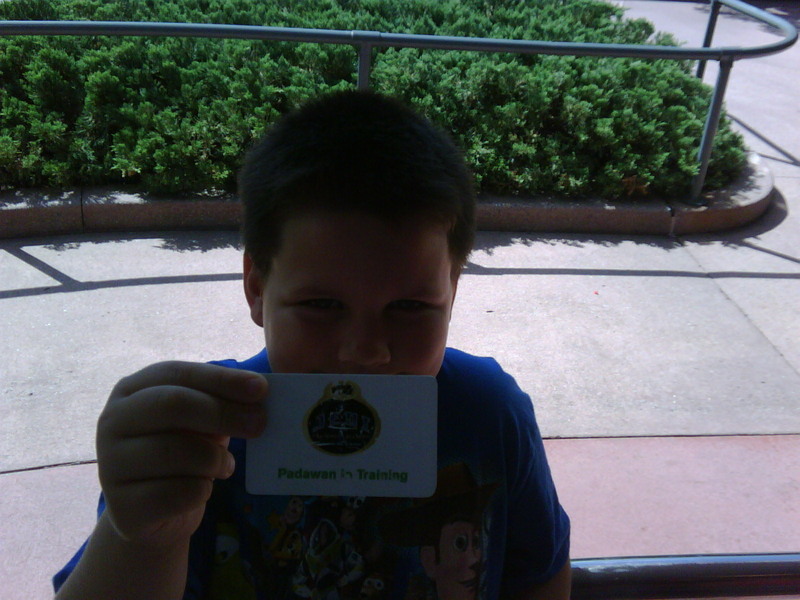 You’ll get a Photopass card and a slip of paper reminding you which Jedi Training Academy your child was in. After the show, you can go to the Cover Story shop to have any of the pictures that were taken added to your Photopass card. You can either purchase them on the spot, or take the card home and view them at http://www.disneyphotopass.com to review at will (as well as any other pictures that were taken on your visit). They have creative borders you can place on the images as well, including Star Wars ones to help frame your child’s experience for a lasting memory. My son is a HUGE Star Wars fan, and his favorite character has always been Darth Vader. He loved to watch the movies and see the progression of Anakin Skywalker as he succumbs to the dark side of the Force, and is finally redeemed (debatable) by helping his son Luke defeat the Emperor. We’ve seen the Jedi Training Academy show many many times, but Alexander has never participated. The line was short when we went so he asked to do it. I don’t think it’s possible to imagine what an amazing experience it is to be able to live a fantasy like this for these children. 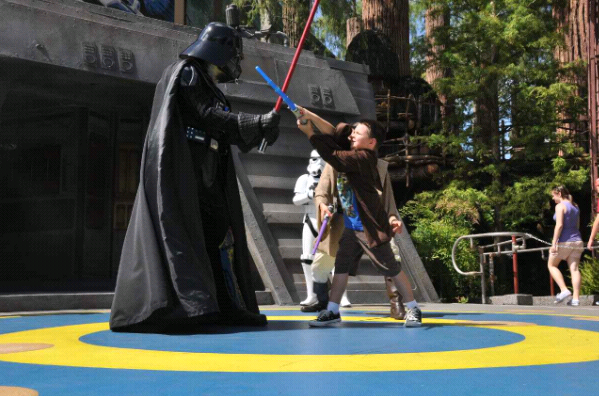 To participate in a sparring match with Darth Vader, twice their size (three times for some of those 4 year olds), is pretty awesome. My son thanked me about 80 times for letting him do it. It let him live a dream.